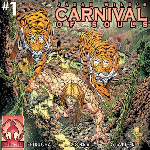 Markosia Enterprises (the home of the soon to be released Shadowmancer comic book) in conjunction with APComics has signed Jazan Wild's Carnival Of Souls !!! The news will be officially announced at the San Diego Comic Con. The first issue of Jazan Wild's Carnival Of Souls will released this Halloween! There will also be a CD of music inspired by the book. The 13 track CD is produced by Bob Kulick, co-produced by Curt Cuomo (KISS, Stan Bush, Lenita Erickson), and will contain a digital version of Issue #1. The comic is written by Stefan Petrucha and penciled by Kevin Conrad (who worked on all 31 issues of the Psycho Circus comic book series for Kiss). There will be a limited edition San Diego Comic Con special sized comic book and 3 song sampler available for sale at the APComics booth. Jazan Wild will be signing books throughout the weekend at the Comic Con. Mr. T will be making an appearance on Saturday to sign his comic book at the booth as well. Looking forward to seeing everyone there! The full length CD will have a cover version of "Rock N Roll All Night" and co-producer Curt Cuomo co-wrote 3 songs with Jazan Wild on the CD. 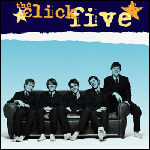 The Click Five will release their debut album "Greetings From The Imrie House" in August 16. The album features guest appearances from Paul Stanley of KISS and Elliott Easton from The Cars. The album title is a reference to the street they lived in Boston while recording the album. 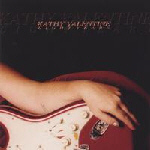 Kathy Valentine, bassplayer for the Go-Go's, will release her very first solo album on September 6. Titled Light Years, the album features guest appearances by drummers Clem Burke (Blondie) and Pete Thomas (Elvis Costello And The Attractions), and by guitarists Gilby Clarke and… original KISS spaceman Ace Frehley. On how she met Ace and got him to play on her album, Kathy says: "I met Ace through a friend, he came to my birthday party and then we had several occasions to socialize. I invited him to do a solo on my record and he was nice enough to say yes and then actually do it. I don't know much about him as a guitarist, but I love the solo he played on my song Bad Choice." For the moment the album is now available through CDbaby.com already, and will be out on Kathy Valentine's own label All For One Music via Redeye Distribution in September. 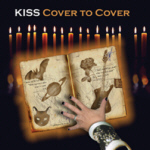 June 12 : KISS inspired and parody discography added. Since a year or two, some viewers of the KRR-website made suggestions for another discography section next to the cover version- and Tribute album discographies. Thanks to Thorbjörn Brorsson and Paul Autry, KRR was able to add the "KISS inspired and parody discography", which features album releases with Kiss-look-alike album covers and songs which mentions KISS (or one of their members), and all kinds of other releases which are not listed well when these were simply placed in the cover version discography. 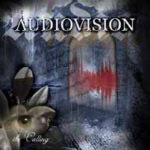 Check this new discography page by clicking on the "More Info" button. June 8 : Australian rock band covers KISS "Cold Gin"
Australian heavy rock band Shotgun Sacred have done a rockin' cover of the KISS classic "Cold Gin" on their newly released EP, A Dark New Order. 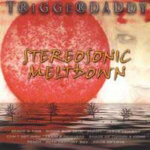 Along with 3 other covers there are 2 original tracks on the EP and you can check out a sample of some of the songs, including Cold Gin, at www.shotgunsacred.com. 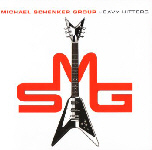 The 6 track EP is available for purchase for just (Au)$10 plus P & H.
According to CD Universe, the "Michael Schenker and Heavy Hitters" album, featuring an all-star lineup of musicians (including Eric Singer) based around guitar virtuoso Michael Schenker (MSG, UFO, SCORPIONS) paying homage to their contemporaries, is scheduled for release on July 12.
showcasing their renditions of such classic songs as "War Pigs", "All Shook Up", "Money", "Doctor, Doctor" and "Hair of the Dog", to name just a few. Also new on KRR is an interview section. Added are some older interviews by Julian Gill (KISSfaq), but in the future we will try to do some more, especially with musicians and songwriters related to the (ex-)members of KISS, easily described as the people what this website is all about. To give us a start, Gabriel Ravarini mailed us a very interesting and unpublished interview with Gerard McMahon, best known as the songwriter of KISS "Is That You ?". We really appreciate such help and support, so if you have a (un-)published interview shelved, which could be useful for KRR / KISSfaq to publish online, feel free to contact us. As you probably may have noticed, the new version of the KRR website also have added some interesting music samples of some rare Kiss Related Recordings like demo's. For the moment most of the samples are taken from Julian's original website, but from now on we will try to add some more samples weekly. Added recently are samples from Black Sabbath's "Star Of India" demo (1985) (featuring Eric Singer) and VENUS ENVY's promotional disc (2004) with Ace Frehley. "I'm in the studio weekly working on my solo album. Mixing has started and the tracks sound tremendous. I couldn't be happier with the way it's turning out!" KISSFAQ: At a time when I have less and less time to devote to tracking down the related discographies, I felt it was time to bring someone on board to help with that aspect of the website’s information – I’ve neglected it for too long. I’ve long been a fan of Jelle’s "KISS & Related Recordings" website, and the information it contains, and respect and understand the hardwork that has gone into compiling and organizing the information. A big "thank you" to Jelle for all of the hardwork he’s put into site in the past, and for moving it over onto the KISSFAQ. "After discovering the internet summer 1996 I thought 'why not build a website by myself' . Most KISS sites informed about the same kind of issues, so I was thinking about something original, like starting a website on the material that I collect (since 1983), such as Kiss Related album releases and demo’s, all I knew of at the time, starting with Wicked Lester, Chelsea, Lyn Christopher, to Desmond Child, New England, to the large amount of 1980s releases, which are in someway related to Kiss. With about 10 tribute albums in my collection (1997) there also was a start for a Tribute album section as well as for other Kiss covers. At the time there was no website which had a pure issue on Kiss Related Releases... (except for a very first version of KISSfaq --- which merely summed up bootleg albums, starting with Wicked Lester). The first version of the KRR website was on summer 1997 (www.kisstip.nl). Today it’s nearly unbelievable how many Kiss Related albums are released, as well as the large amount of Tribute albums and hundreds of other KISS cover versions. Together we will keep to inform you about all Kiss related and co-written songs, guest appearances on other recordings, Kiss Related discography and demo recordings, Kiss tribute albums and other coverversions. This time with more music-samples and interviews with musicians involved with Kiss related albums..."